White fillings made from a natural-looking composite resin are a more cosmetic and conservative dental option than traditional amalgam (silver) fillings. Lowell dentist Dr. Szarek can preserve more of the original tooth structure using composite fillings and can blend the fillings to closely match the color of the tooth. The proper term for what is commonly known as “silver” fillings is amalgam because the filling material is really made up of a metal alloy of silver, some copper and zinc, mercury, and possibly tin. They have been used by dentists since the 1840’s. 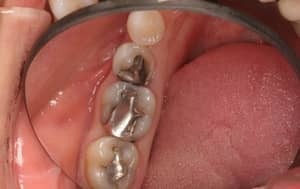 While some people worry about the mercury content of the fillings, there are no conclusive studies proving that there are any safety issues with amalgam. Lately, most people seem to prefer the white composite fillings. The technology for these fillings has advanced to where they are very durable and will last for many years. Their most obvious advantage is that they are tooth colored, so they blend in and aren’t visible when you laugh or sing. But they have practical advantages, also. There tends to be less tooth sensitivity with composite fillings, they bond to the teeth, and they often don’t require as much drilling away of healthy tooth structure. The pictures below illustrate how Dr. Szarek uses composite fillings to perfectly blend in with your teeth. You are unable to tell that the patient received treatment for cavities. Dental schools tend to emphasize the placement of amalgam fillings on back teeth. For this reason, cosmetic dentists who do a lot of composite fillings need often additional training in the use of the different composite materials. 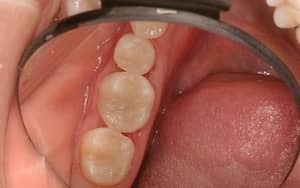 There are special bonding techniques and placement techniques when these fillings are placed on back teeth. When dentists do not have this extra training, the fillings do not hold up well and there can be painful post-operative tooth sensitivity. So be sure that when your dentist is placing these that they have extensive experience with them. They require less removal of the natural tooth than traditional amalgam fillings. The teeth have an all-white, natural appearance. They require less drilling to place. The material bonds directly to the tooth and, when placed by a skilled dentist, has a lower risk of breakage or causing damage to the surrounding tooth over time. Do not carry the same risk of metal fatigue and corrosion as traditional amalgam fillings.If you are interested in white, natural-looking fillings, request an appointment online or call us at 978-454-9332 to schedule an appointment. Imagine yourself with a beautiful new smile. I just finished my first cleaning appointment and I am so happy! Ashley was amazingly gentle and thorough. Dr. Szarek was also great! For someone who has always been petrified of the dentist, I can honestly say that come my next appointment I will walk in without butterflies in my stomach! Great job! Dr. Szarek recently replaced my front crowns and I absolutely love them! He did such great job. I love my new smile. The staff is very professional and friendly! Went to him for the first time yesterday due to a cracked tooth. Not only did he fix it but it was pain free! I have had bad experiences with dentists, which makes me anxious, but he and his staff were amazing!! Very experienced, practical, and kind. Dr. Szarek spends thousands of hours at continuing education to give his patients the best care. I completely trust Dr. Szarek's recommendations and care—he is the best! I'm a huge dental phobic. Dr. Szarek and staff make all those fears go away! Such an amazing team!